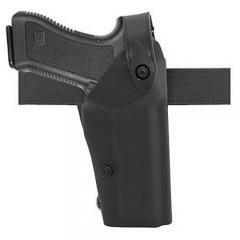 This is the STX Tac version of the popular Safariland 6280 holster. The Safariland 6280 Holster provides law enforcement officers and others who carry handguns in tactical situations the optimum combination of safety and weapon readiness. Safariland is known around the globe for its outstanding police gear. This STX Tac matte finish version of the Safariland 6280 SLS System duty holster features the same patented rotating hood and tensioning device for increased weapon retention, yet still affords ease of draw. The Safariland 6280 SLS is a top draw, straight cant holster. For additional retention security, these options are available for the 6280 holster. Holster is great and functions well. handles wear better than leather does. After all my research I found the holster I wanted in stock and got quick delivery. After getting the holster on my duty rig I should have done this years ago. Great holster. This holster is popular in my book, it is safe and durable, I recommend it to all my friends and fellow officers. This a great deal and price is affordable. Excellent patrol and range holster. It accommodates both my Sig Sauer P226 and P227 handguns without issue. Excellent duty holster. Fits my Glock 19 and Streamlight TLR-1HL perfectly. CopsPlus was on point with shipping and delivery as well. Would recommend. I ordered this holster for my Glock model 19 with a TLR-1HL and it works perfectly. I would recommend this holster to anyone. It fits the TLR-1 and TLR-1HL perfectly even though it is listed for the Insignt M3. I just bought a Glock 34 with a Streamlight TLR-1 weapon light, and this holster fits perfect. Draws are smooth and consistent, and the holster does not ruin the finish on my gun. What I like most about Safariland holsters, is the accessories available for them. You can upgrade the level of security from a Level 2 to a Level 3, change the ride height from low to mid, add a quick release plate to make removing from your duty belt a breeze, etc. I highly recommend this holster. Wish it was a level 3 with ALS, but it is perfect for what I was looking for. Excellent product description. Super fast product delivery. One of the best low price holsters I bought, Works the way it's supposed to as advertised. I use it as a service holster and everything works. Excellent holster for the taser M18C. Superb security with the addition of the Sentry Lock. The holster is exactly as described, I'm very happy with my purchase. Nice holster, my XD fits perfect. Best holster out there. I tried three other holsters prior to this one. Perfect holster. Kimber 1911 pro carry tlerl II. The closest match would be a "Springfield Armory Operator 1911-A1 (5" bbl)" IF its a 1911 with a 5" barrel and railing system. Does the holster have a thumb release, hood and guard. This only has a hood guard, with no thumb release. The holster with the thumb release and hood would be the 6360 holster. Will my xdm9 compact 3.8" barrel fit in the full size 4.5' barrel holster? It it will fit but there will be some space between bottom of holster and end of muzzle due to the shorter length. Is this holster a hard material like a plastic? Yes, it is a hard-shell plastic type material that is heat laminated and molded to the shape of the weapon and it's accessories. It is extremely durable. Its the only product available that addresses seat belt abrasion issues. Will not absorb water or sweat, dries quickly, and is easily cleaned with mild soap and water or Armor All. Features a SafariSuede liner that absorbs excess oils and lubricants and helps protect the finish of guns.